I am a native Californian and my husband of 30 years is a fifth generation Californian so our roots here are deep. I have three daughters, all in their 20s (beautiful I might add), and one crazy dog named William Wallace. I like to call him Bill but my husband calls him Wilhelm as a tribute to his Germanic heritage . . . William is a miniature dachshund. While it has taken some time to get comfortable with the term, I now confidently call myself a “WRITER.” Saying that I was a writer felt presumptuous, like I was foisting myself into the same ranks as the greats – Hemingway, Steinbeck, Dickens, and Shakespeare. Heady intellectual group to consider my peers. The uneasiness with the title “WRITER” changed when I finished my novel, people read it, and to my utter delight, liked it! My novel is called In Search of Beef Stroganoff and is about a young woman who longs for her deceased mother and tries to feel close to her by replicating her beef stroganoff recipe. She treated her mother poorly and a series of reality checks causes her to reevaluate her life and set out to become a better person. In doing so, she finds herself, love, a passion for cooking, and an 88-year-old best friend. What are my interests you ask? Well, I guess you didn’t ask, but here they are anyway in random order, except for the first one which is my family . . . reading, writing, gardening, music (especially The Beatles), theater, cooking, travel, and making home a cozy nest for when my family comes home. Oh, and feeding people. Come over for dinner some time! Why, thank you! I will certainly cook up a nice vegetarian meal for you. Sorry, I’m stuck on the first comment. What topic attracts an eclectic and snotty crowd? I never saw or heard from that guy again. I don’t know what his deal was. His website looks legit, but his comment reads like spam. He wanted to “write-click” to fix some error on my post? Weird. Guess what!!! Our daughter is picking up her 8-week old golden retriever on Sunday! And, I’ll be arriving in her town to visit the very same day. I’m so stinking excited. I wish I could show you a picture of all that puppy goodness! Excellent idea for a blog post. The puppy looks like a miniature version of your Remy. She is a golden, but very white. A fluff ball! “…like I was foisting myself”. Hmmm. Whenever I read grammar- and writing-related stuff with errors, I just wish I could write-click and fix it on the spot, without sending an email, without posting a comment. Alas, I can’t. I do enjoy your writing, however, and your thoughts. Plus, I think this topic attracts an eclectic (and, yes, snotty) crowd, and I fit right in! I’ve been trying to find your email address so I can communicate with you directly about grammarhome.com, but no luck. Is that privileged information? Wait! “Privileged” vs. “priviledged”! I have to add that to my compendium of grammar and spelling pet peeves! I’ll be right back. My email address is robincoyle@gmail.com. There is a link under “Write me” at the top of the page. Most of my followers are writers and certainly have opinions about usage and grammar. Those were a fun couple of posts to write and to read everyone’s comments. I poked around your website. Excellent resource. Thanks for pointing me in that direction. Of course there was a typo in my response to you! Damn it. I too, had a hard time coming to terms with the label, “writer” to define myself. You do seem like a fantastic writer and your novel sounds incredible. When can I expect for it to be up for purchase? Well, the novel is going nowhere right now. It is all but finished and I plan to FINISH THE DAMN THING this year. I am not yelling at you. I am yelling at me. I can’t stall out right before the finish line! It just needs a final polish and then I begin the challenge of getting it published. Thanks for the “fantastic writer” bit. You made me blush. You’re welcome! It’s true. 🙂 I can’t wait to see your book. Hi Tess! You can drop by anytime! Invited or not, you are always welcome here, even though it is a tad quiet over here as of late. Happy New Year to you. Be well, my friend! The jury is out on that, but I hope so! My beloved uncle passed away and I am trustee of his estate, which is taking beaucoup time! You too, Tess. Happy 2014 to you! Ditto, Robin. Take it easy.. ‘K? Hey Robin, are you going to return to the blogosphere in 2014? We still miss you! Happy New Year to you and yours! Vanessa!!!!! How great to hear from you. I hope you are well over there in jolly old England. I hope to get back to blogging in 2014. My New Year’s resolution is to get back to writing in general. I’m off to check out your annual New Year’s Eve video . . . you talented thing! Miss you too and Happy 2014! Don’t forget Twain in the list of greats! How could I forget Mr. Twain!? You had me at…”Is cursive dead?” My new interest is handwriting from around the world. You got me again with the pic of the base of the Eiffel Tower…I have a dream to stand right there one day. And then you really got me with the talk of your mother…and beef stroganoff. My mom was German and I lost her at the age of 39 when I was only 11 and guess what? She made a mean Beef Stroganoff which you have now inspired me to replicate! Thank you! It sounds like we have a lot in common! My husband took the picture of the base of the Eiffel Tower when we were there a year and a half ago. Paris is one of my favorite places on earth. If you find your mother’s beef stroganoff recipe, let me know! Hey Rohan . . . thanks for wandering over here. You did a great job on Dianne’s review. Ha! Maybe you are the character in my book! However, she had to travel the world first to find her mom’s recipe. My love of my mom’s beef stroganoff was the inspiration for this book. Are you willing to share your mom’s recipe? I’m delighted you found me too. Any idea how you did? I’m always curious about such things . . . the mysteries of WordPress and all. My Mom claimed her beef stroganoff was inspired by a recipe she read in the Cleveland Plain Dealer many years ago. She never had a recipe written down, but she paired inexpensive cuts of beef (because she cooked it slowly so that it melted in your mouth) with Spanish onions, mushrooms and garlic. Her secret ingredients were dried mustard and a touch of tabasco sauce, then finishing off with sour cream. I add fresh dill, and use Dijon instead of dried mustard. It makes strong men swoon. Ooohhh . . . Tabasco sauce! That is an interesting twist! I bet it makes the flavors pop. Dallas? Dallas who? I’m drawing a blank (not unusual!). Hope to see you around too. I’m off to pop over to your place! You’re novel sounds great, Robin! 🙂 I’m a writer too in case you didn’t know. I did know that about you. What kind of stuff do you write? I write Christian fiction, to say it at the broadest. But genres in it are action, adventure, and light romance. Right now I’m working on a book, Saving Ember, and rewriting Something New, my first real book I’ve written. Have you written anything besides the book you talked about on this page? No, not really. I’ve written a couple of short essays I rather proud of tho. Almost a year ago I submitted an excerpt on Write It Sideways for a critique, you offered me some great feedback. Zoe! My apologies! I saw this the day you sent it and was interrupted before I replied and then I forgot! That is so cool. Congratulations on being published. Thanks for letting me know. I’m off to check it out. When you say your book is finished– is it actually out in the world? I looked around for a link but could not find one… Am I missing it? Alas, “In Search” is not out in the world, yet. My “About Me” is rather misleading, I guess. I am polishing the last bits and will be pitching it soon. If no takers, I will self-publish. When I publish, I will be singing about it from the roof tops! Thanks for coming by here. I love to see new faces! My pleasure! And in that case I think I’ll have to follow for updates. I’m in a similar place with my own fictional novel and polishing as well as trying to get the word out about it. It’s great to connect with other writers on this journey! May I be so bold to suggest you check out my Strong vs Weak Word series? While editing my WIP I learned quite a bit and share the tips in this series. There is a link on the left side of my blog. ah…sorry for all the repeat comments..wordpress is playing with us..feel free to delete them! Weird when it does that. Thank you . . . but it isn’t my birthday. What made you think so? ah..eh…”Supposed to be 70-ish today” ? Ha! The temperature, not me! Fie on you. I don’t look THAT old! I look old, but not THAT old. aha…sorry we totally misunderstood your recent comment haha .. we thought 70-ish didnt sound right ha! Hi, thanks for having a peruse of my blog.Glad you liked the Armstrong post.I’ve enjoyed reading your blog for a while now.The writer series:strong vs. weak words,is brilliant.Just brilliant.Like the world and his wife I aspire to write full-time.Reading blogs like yours keep fires kindled. ha ha ha ha typos.Jeez having one of those days. What a lovely thing for you to say! So you’ve been lurking in the shadows around here . . . in a non-creepy stalker kind of way? How nice you weigh in. Any idea how you found me? I’m always curious about that. ha ha ha, yea, not in a creepy stalker way. It was through your writer blogs,I was having a good rummage through ‘likes’ and blogs I follow sections on other people’s blogs and eventually through clicking and reading et viola I found yours.Blogs are a brilliant devise of expression but with so many keyboard opinionists (not a real word, although sounds like it should be) spouting forth, it can be difficult finding the one nugget of interest.I like how you write and have found the writers segments fascinating. I believe opinionist should be a word too. Let’s call Mr. Webster. I take your words as a lovely compliment. Thank you. Please keep stopping by and say hi now and then! I found you via Marsha Lee, and I’m so glad she sent me here! I find it easy to think of myself as a writer, but it’s not so easy to say that to others. It still blows me away that people I don’t know, who live on the other side of the world, read what I write and then like it so much that they come back for more. And you are so right, blogging is so addictive. I’m glad you found me too. Or, I should say, we found each other. Thanks Marsha Lee for the “blogger dating service.” So nice to meet you! Why is it that someone who plays golf easily calls him/herself a golfer, but someone who writes is hesitant to say writer out loud? We are an odd lot. Doing all this blogging has given me a lot more confidence about my writing though. I have so many goals on my to do list. My writing is better from blogging. Writing everyday gives me the practice, and reading other blogs gives me ideas about how to engage readers . . . what works, you know? Hi, Robin, I’m tagging you in the “Next Big Thing Tour” in a post on 12/26. The tour is designed to post on Wednesdays, and I know this is a heck of a time of year for it. So please don’t feel obligated to do up a post for 1/3/13! If you’re interested, I can send you the questions so you have time to prepare. Hope you have a wonderful holiday season! Well, thank you JM! I’d love to be a part of it. Yes, please, send over the questions. My email address is robincoyle@gmail.com. It will be a nice way to kick off the new year. Aren’t you the nicest thing! And congrats to you too. I have the patience of a 6-yrs old. I sent you an email. Thank you! And I just responded to your email. What do you mean by the “patience of a 6-year-old” comment? I wish I was more patience? You mentioned playing a part on TV – who and on what show? I was joking . . . it was a line from a TV commercial from years ago. Writers are a strange lot. We are nervous about calling ourselves writers for some reason. Not to sound self-serving, but watch this video I posted over the summer. Really. I insist. The young man doesn’t a great job with the concept of calling himself a writer. It made me all teary. I’m so glad you found this humble blog too. Please visit again soon, and often! I love the description of your novel, as well as your family life! I look forward to reading more of your posts! Keep writing! Oh, I shall keep writing. But in the mean time, I have to respond to tons of comments over on my post about cursive writing. It created a firestorm! I was thinking of making my Mama’s signature dish…and try to duplicate it while she’s still around to tell me if it’s up to par…your book is something I’d want to read and feel sad over. What daughter hasn’t been horrid to her mom one time or another even unintentionally so? That is an excellent idea . . . making your mom’s signature dish. The character in my novel kicks herself that she didn’t do that very thing. If I may ask, what is your mom’s signature dish? I love reading about food! Hence, food plays a leading role in my story. You know how to brighten my day, Lynne. Thank you, and congratulations to you. Wear that award tag with pride! Well thank you so much! Hope I made you laugh. Hello Julie! Thanks for stopping by here. I don’t know if you saw that I am away from blogging for a time while my dad is in the hospital and we figure out the next move for my mom with Alzheimer’s. I hope to be back soon! Since I love dinner parties, even virtual ones, I will do this! Might take me a while to get to, but I’m excited about it. Thanks Ella Dee! Someone will be by to do a little camping as soon as the football games start. I can’t say who it is, but his initials are RR. Sorry I couldn’t deliver a letter like I promised. My vacation have been cut short suddenly because my grandmother have left us with a large gap, we are still trying to fill it. I hope all is well with your precious in the army. I am so sorry! Are you ok? Dumb question, right? I am sorry for your loss. I’m alright. It is the same path we all are heading toward, so eventually we accepted it. Thank you for you condolence. I don’t know why, but for some reason, every time I try to view your blog, it takes longer time to load. Any how, I wanted to tell you that I have nominated your blog, for the second time. What can I say, I like what I read. Here’s the link, have a good day. You are the second person to mention my blog is slow to load. Oh wait . . . maybe you were the first person. I can’t remember. I wonder if others have that problem. But, as to the matter at hand, THANK YOU! How kind of you to think of me in your nomination process. And congratulations to you! I loved tag as a kid. I still have the scar on my knee to prove it. I slid on the asphalt while dodging my chaser. Well aren’t you the nicest person ever! Thank you! I that a new award kid in town? I’ve seen it around but I don’t know where it started or when. I don’t think it’s a huge popular award. Hello Robin, I stumbled in here although I swear I was not drunk at the time.I don’t know what made me misstep but now here I am. Seriously I think it may help one of my sisters to deal. a few years ago both our Mom and Dad both died within a month of each other (natural causes- they were old) and she can not let go. She was especially ‘addicted’ to our Dad. People get old and they die. It is the natural order. I and my other siblings have accepted it, but she cant seem to move on. I am hoping that your book may help her to find a way to make peace with it. NOW I know that may be a heddy expectation to put on your first book, but I am willing to give it a shot. Congrats on this big step and good luck. Did some mention the Beatles? I am touched by your comment and request Mr. Underwear! Or, do you prefer to go by AirCooled? I do wonder how you found me. Ah . . . the mysteries of blogging never cease. Jokes aside, I am sorry for your loss. So sad to lose your parents within a month of each other. My parents are in their late 80s and my beloved uncle is 91. I am bracing myself for the inevitable. I am also sorry to hear that your sister is having trouble recovering from her grief. As I typed that, I wondered if one can ever fully recover. As you discovered on the River (love your name for Amazon), *In Search* is not (yet!) published. Fingers crossed on that front. I am happy to share a PDF of *In Search* with you and your sister. However, I am in the middle of editing the beginning. It is readable, but I fear it drags a tad. I am smoothing out the first few chapters. I promise you I will send the manuscript to you as soon as I finish tidying up the first section. Hopefully that will be in a couple of weeks. And yes . . . I feel pressure to perform in helping your sister find peace. Fortunately, my main character finds peace in the aftermath of her mother’s death. Perhaps it will give your sister hope. I take it you are a Beatles fan too. We groupies need to stick together! Thank You Robin. I will look forward to it. Well thank you, you sweet thing! I’m delighted you like the book title. Now to finish editing! I hope you do stop by again August. What a delightful thing to find on a Sunday morning! Thank you so very much! Thanks for the like on my reviews. I’m so happy I discovered your blog! I Your explanations are clear and hilarious. I’m passing this link on to my husband, a high school English teacher who is a stickler for correct language. Ha ha! I was afraid to follow your blog because my list of books to buy is miles long! Adding more to the list based on your reviews might break the bank. However, I can’t resist good book recommendations, so I am off to follow you. I cringe to think an English teacher will be reading my blog. Yikes. Tell him to be gentle in his comments on my poor use of the English language! Thank you so much! How delightful. Thank you kindly! Yes, I am reaching for a tissue as I type. How delightful! Thank you. Award ceremony and long acceptance speech coming soon. This is, however, a brand-spanking-new award — I was one of the first awardees. So I hope you’ll help get it going! So cool! A new award out there. Thank you JM for the nomination. It will be fun to accept. How delightful! Thank you so much Lynne. I will accept the awards soon. I’m honored you nominated me. Wow! Thank you so much. I love your blog too! I’ll accept it soon. Weird. Your comment went to spam. Anyway, I relate to what you said, and hopefully soon I can find the confidence to proclaim myself a writer, too! Call it a NOVEL! Call it a BOOK! Call is a MANUSCRIPT! That it what it is! You are a WRITER! Ok, I will quit yelling at you. I know what you mean. I still duck my head when I say, “Yes, I wrote a book.” And then I look off into the middle distance and hope they don’t engage me further. Funny. We are a modest, bashful lot. Glad you liked my blog and I am popping over to see yours, you WRITER you! Haha, I appreciate the encouragement! I am a writer cheerleader. So I’ll be right over to sing along to the Beatles and eat Beef Stroganoff!! Sounds great. I went to Mills College so know the area well. Sounds like an interesting book. Cheers! Let’s see . . . I grew up in Sunnyvale, worked in Palo Alto, lived in Mountain View, San Bruno, San Mateo, and Pleasant Hill. Yes, come on over! We have lots to talk about! Thank you so much! I’ll accept soon with honor. I rescued your comment out of spam. I wonder why it went there! How great is that!? Thank you so much. The red carpet will roll out soon. I am at the cabin right now but I have to drive home soon. I DON’T WANT TO LEAVE. Yes, I was shouting, kicking, and biting. I like your “About”–just long enough to get to know you a bit, and short enough to read in a hurry. You mentioned on my blog that you like my tag – Organizing -101 – it is not me giving advice, it is me discovering how to get organized – just so you don’t think I am an expert or anything. Like the premise of your book – will have to find it. So glad you like it. Reworking it is on my to-do list. I’ll take organizing advice where ever I can get it as I am a bit of a nerd about keeping things organized. Also, my book it not (YET!) published. I am doing a new round of edits (see my Strong vs. Weak Word series) and when I am finished, I will attempt to get it published . . . or self-publish it. Hi Robyn! Nice to ‘meet’ you. Thanks for following my blog. I’m going to hang around yours for awhile and check things out. You have a lot of articles I’m dying to read. Wonderful! You are welcome to explore to your heart’s content! Any fan of The Beatles is alright with me! Robin – Thanks for stopping by and the follow. I’m glad to have found you. My husband and I honeymooned in Lake Tahoe. It was a beautiful week spent in a little cozy cabin. Mother Nature was on her game when she came up with Lake Tahoe! Robin – I completely agree. She also brought her A-game when she created Michigan and the Great Lakes. Robin – I completely agree. Beautiful doesn’t even come close to describing it. Just found you Robin and love the way you write. Well Thanks . . . since I love to travel, look for me over at your place too! That is about the coolest thing anyone has ever said about me. Thank you! You probably already have a metric buttload of awards, but I’ve nominated you for another! See my post at http://fearnoweebles.wordpress.com/2012/05/06/my-first-blog-awards-and-first-award-giveaway — and thank you for a great blog!! Well thank you so much! What a delightful way to end my day. Will you do me a favor? I commented on this on YOUR post too but it didn’t show up (see today’s rant on this issue). Did it go to your spam folder? Will you let me know. If it did, any ideas how to fix this problem? Why am I suddenly spam to the world? I feel so insignificant. It did indeed to go spam, for reasons unknown—it was obviously much different in content from the real spam, so I’m not sure what WP’s deal is. Maybe it’s that WP can’t handle too much awesomeness at once, it just short circuits. Hey Robin, I know that Maggie’s already got you up for a Liebster Award, but I’m following suit! 🙂 You totally deserve it, your blog is so entertaining and well written! Hi! I couldn’t resist listing you as a nominee for the ABC Award even though it was you who nominated me, as I’m so glad you’re part of my blogging community. You can read my award post at http://elladeewords.wordpress.com/2012/05/03/a-community-garden-and-abc-awards/ . Ha Ha! I saw that. Oh the pressure, the pressure. Twenty-six more riveting things to say about myself? Tricky. More blogs to nominate, easier. I’ve found some cool new blogs today so the acceptance of the award will be fun. Thanks Ella Dee. Watch for the live broadcast of the award ceremony soon. I’m glad you and I got to be blogging “friends” via the Beatles. It isn’t with just anyone I can have an in-depth discussion of Paul McCartney on my blog. 😀 I love it. I’ll be adding you as a link soon. I love your writing advice, but have much more to explore here. Well thank you. I agree. I’m glad we became friends via The Beatles. I am sad that you are about at the end of your A to Z all things Beatles. Don’t worry! I’m going to do a series each on Paul and Linda McCartney. I need a break though! Just too many other things I want to cover. – By the way, Linda’s photography intrigues and inspires me. I like your introduction, very well said. Good Luck with your writing. Hi Robin. “Wilhelm” must be adorable. I had a standard size daschund called Hobbes who was my old man. Someone said he needed an ascot. I miss him very much. I’ll be back by your blog again soon. Take care, and thanks for your visit today. Don’t tell Wilhelm about the ascot thing. He will insist on wearing one. Perhaps a top hat too. Hobbes is a great name. Was his brother Jeeves? What a treat. My thanks go to you, you sweet girl. Watch for my award ceremony soon. Robin, thanks for following! Your novel sounds like a great read! You have every right to call yourself a writer, and to feel proud of it. Thank you again! Thanks Katy! I’d love for you to read it. I saw you on Rinn’s page, looking quite relaxed. Now, I see you live in Sacramento. I was born and raised there, before escaping to Chicago in the late ’80s. There is nothing like the smell of pine needles at Lake Tahoe. As soon as you step out the car, all stress seems to melt with the first inhale. I am sure the air is a great writing tool. Good luck with your book. Can’t help but be relaxed at Lake Tahoe! I do my best work there. You are right. Step out of the car and your body says……….aaaaaaaahhhhhhhhhhhhh!!!!!!!!!! Tahoe! Where did you live in Sacramento? My husband grew up here and the timing may be such that you ran in the same circles. As you may remember, Sacramento is a very small-world kind-of-town. Ah yes, SacTown… or Sacratomato as we all called it back when Libby’s and Tomatoes were a big deal. I lived in Land Park about seven blocks from the Tower Theater. I graduated from McClatchy in ’61. I was a theater major at Sac State. My family owned a jewelry store at 22 & K Sts. where I worked for 20 some years before going into the restaurant business. I worked for Paragary’s for years, then left for Chicago. We used to go to Camp Richardson when I was a kid and later would rent a house near there, I can’t remember what that was called on the Cal side of Stateline. When I was a teen, we stayed at a friends house, on the water with a pier at Homewood. That was cool. Still called Sac Town and Sacratomato these days. My brothers-in-law worked at the cannery back in the day when they were in high school in the 70’s. My husband went to Jesuit – graduated class of ’76. We still love our Paragary’s restaurants. Our cabin is a couple miles from Camp Sacramento at Echo Summit. We try to spend as much time as we can there during the summer as it is not winterized. Can’t wait to open it up for the summer of 2012~! And look forward to more creative writing while hanging out there. Maybe some day! I’m up in Oregon with no car! Robin! You seem awesome! I wish I could get a home cooked meal from you sometime! I miss my mother’s cooking all the time and mine just isn’t the same. Thanks for checking my blog out, yours looks so fun and interesting, so HELLO back and I look forward to reading about you. Hey Sloan – great name by the way. I’m glad we found each other! Come on over for dinner! Hi, Robin — welcome to the diabeticredemption.com family. Please stop by my Friends page and tell us all a little about yourself, along with the URL for your blog, so my readers can come find you. I’m glad you’ve signed on! I did sign up on your Friends page! Thanks for the opportunity to self-promote. Your Friends page is a great idea. Hi, thanks for the follow! Your blog looks very interesting and I’m always happy to connect with others writers! Best of luck to you and I look forward to hearing more about what you’ve been doing! Thanks Em! I look forward to hearing about your baby-to-be! Thanks for following my blog, Ironwoodwind. Very nice to meet you. I’m looking forward to browsing through your shelves. Hi to Wilhelm. Hi Doug. I would say hello to Wilhelm for you but he is too busy doing nothing. Besides dachshund, he is part slug. Thanks for checking me out. I now return the honour. Thank you, Robin for nominating me! Thnx for stoppping by my blog, introducing yourself & the congratulations. I’ve certainly enjoyed stopping by your’s & will be be getting myself a copy of In Search of Beef Stroganoff, as well as following your blog. Hi EllaDee…alas, my novel In Search of Beef Stroganoff is (yet) unpublished. With my help, it is looking for a publishing “home.” If you are interested, I can sent you a PDF of it. I’d love to have some people read it who don’t “know” me. No pressure! I’m not buttering you up, but your blog is fantastic! Wow! Thanks ElllaDee. I’ll shoot it over to you as soon as I finish a couple edits I am working on. Mrs. C. I’ll have to score a copy of your novel on my next trip to Amazon. I like the plot, and would rather read this while my mother is present. Happy Writing. Well . . . I’m not on Amazon (yet) but would be happy to send you a PDF of my book. Say the word and I will! I’m looking for readers who don’t “know” me. The book does deal with the mother-daughter relationship but is light-hearted as well. Nice that you want to read it while your mom is still around. Very sweet. Wow Pete! I am thrilled and honored! Thank you so much and congratulations on your nomination. Now I know what I will be blogging about today. Cheers! Hi Robin! I know we’ve been exchanging posts and comments for some time now, but I can’t believe I just read your “About” page. I loved it so much that I do want to come over for dinner and meet William Wallace. Haha. Is “In Search of Beef Stroganoff” published? Where can I get it? Hi Corey! Sorry for the delay – I was traveling home from Portland. William Wallace would love to meet you! Me too! Alas, my book is not (yet) published but I hope it will be one day soon. I can email you a PDF of it if you’d like. I’d love your opinion of it. Let me know! Welcome back. Sure, I would love to read your book. Just note, it may take me a while to finish it as I am in the middle of editing mine, but I would love to read it and give you some feedback. You are awesome. I’ll email it to you. If you would like me to read your work, I am happy to return the favor! William Wallace says “hi” back and he’d like to meet your crazy corgis. I’m looking forward to reading it. And once I’ve edited my first novel, I will email it to you! I’ll email you a pic of my crazy corgis. Lol. The cabin sounds idyllic. I recently heard a story that Lake Tahoe has several legendary inhabitants. They are drowned people who can’t be retrieved because the waters are so deep, and sometimes they become visible through freaks of current or water clarity. What an ideal place to write. And I love the picture at the top of the blog. Hi Roz! The cabin is lovely. I wish I could show you more pictures. Since I can’t, you will just have to come for a visit! Not so idyllic is the legend that the Mafia dumps the bodies of their enemies in the lake because the water is so cold (and believe me, it it frigid) that gases can’t form and the bodies don’t rise to the surface. Thus, the murder remains a mystery. The story FREAKED my girls out when they were little! The water is so clear that you can see the bottom like it is mere feet away, rather than hundreds. If one can forget about dead body stories (and I can) the scenery allows words to flow and creative magic (one hopes). Plus, the hiking is great. We took the picture of the Eiffel Tower on our third trip to Paris in September. I love it too! the uncropped version is really cool too. Thanks for writing! This is extremely good. I was amazed to see this info so well put together, definitely going to post this on facebook so the hubby can find it. Cheers! Thank you so much for your sweet comment! Make me happy! Welcome to the world of blogging! I hope it stimulates your creative writing. 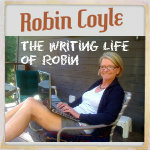 I am officially a “The Life of Robin” follower an cant wait to get emails about new posts!!! This is quickly going to become another website I’m addicted to just as I have become with your writing. The cabin writing picture is adorable. I do have one issue tho… William Wallace made a photo appearance and so did one daughter!!! Where are the other two!!! Do not deny the world evidence of the beauty you described!!!! Love you!!! Jill designed the blog months ago and just threw a random (although I love it) photo on. I need to change it to show the beauty of all my daughters! Trust me, William will get second billing, Damn Dog. SO HAPPY you started a blog… Now you can let your amazing talent and love for writing soar, while giving others the pleasure to read and enjoy. You go girl.